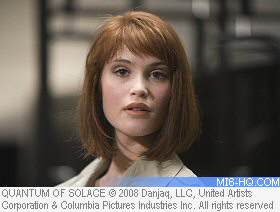 On the 4th of January 2008, Gemma Arterton confirmed to the Hollywood Reporter that she had signed on to a Bond-girl role in 007's latest on-screen adventure "Quantum of Solace". The role was in contention some time before she finally landed the project and much speculation surrounded the young British actress. It was subsequently reported that Gemma would play MI6 Agent Fields, a British Security Service operative assigned to 'look after' 007 on his mission in Bolivia. Arterton describes her character as a likeable woman's woman but with a strong personality who is liable to clash with Bond's bloody-mindedness. "There's something very fresh about her. For me, she's got stuff that all women can identify with." Born in January 1986 in Kent, UK, Gemma Arterton attended Gravesend grammar school and in a summer drama class she won a grant to attend the Royal Academy of Dramatic Arts - the prestigious dramatic arts college whose home is Bloomsbury, London. During her time at RADA, Arterton showed enthusiasm and passion for theatre and won roles in over ten of their regular productions, including classics such as "An Ideal Husband" and "Vera Drake". Still taking regular classes with the college, Gemma won her first professional role in "Capturing Mary", 2007's TV drama, directed by Stephen Poliakoff. Straight out of drama school and onto stage in Shakespeare's "Loves Labour's Lost" for a run at the Globe Theatre - the undeniable home of The Bard - Gemma quickly became a rising star of the British entertainment industry. In this production, she played the role of Rosaline, and unbeknownst to her, Hollywood was just around the corner. With charming beauty and a clear natural talent for the performing arts, Gemma was picked up for an onscreen role in "St. Trinian's", opposite "Casino Royale" star, Caterina Murino and a swell of big-name British actors including Colin Firth, Rupert Everett and Stephen Fry. Gemma had to fight of the likes of Sienna Miller for the role of the Head Girl, Kelly, in this big-budget Brit comedy. Through her successful work both on-stage and in film, Gemma came to the attention of EON Productions, looking for a young and talented actress to appear in "Quantum of Solace". Gemma talked briefly about landing the role: "I went to two auditions. I was in a play at the Globe in London and the casting directors came to see me in it," she explained, "I was playing a very Bong girly type of role, but Shakespeare. It was Rosaline in Love's Labour's Lost, and she's very haughty and sharp. They asked me in for an audition, which I never thought I'd get. Then I got a second audition where I met the director and everyone, then I had a screen test which was petrifying, then I got the part." Working with successful agent Sally Long-Innes, representative of 007 himself, Daniel Craig, cannot be a bad thing. In a recent interview Arterton described her rendezvous with 007 as an opportunity to do something big and a pathway to even greater things: "[My agent] said ‘If you do this big film, it will open the doors for all these other brilliant things. But you have to do the big film first'." Arterton truly believes in taking chances in order to pursue her dream career, "I think it's difficult for a young girl like me, because there's a certain time for young actresses, which is like a really juicy period when all the parts are love interests and young heroines. Of course, there's always work for men whatever age they are. So I'm really going to go for it. And if it all goes wrong, I'll go and do panto!" Arterton need not worry as she has a busy 2008 with three film productions, including Bond, and a mini series due this year. Gemma recently wrapped on Guy Richie's latest action pic, "RocknRolla", where Gemma is June in this upcoming mobster-flick. Also due this year is "Three And Out", a twisted comedy of love and loneliness and time-traveling-romance, "Lost in Austin" where Arterton will portray Elizabeth Bennette, a classic character from Austin's fiction. On top of her acting, Arterton practices dance and is learning to play the guitar.